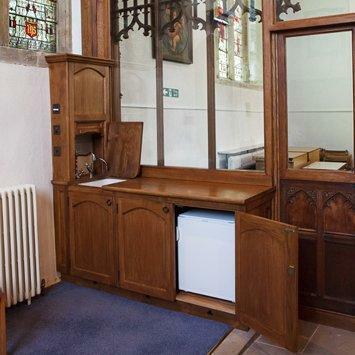 The C.13th, Grade I Listed All Saints Church, Great Chesterford, needed a small warm space within the church for use as a crèche and meeting/robing room. 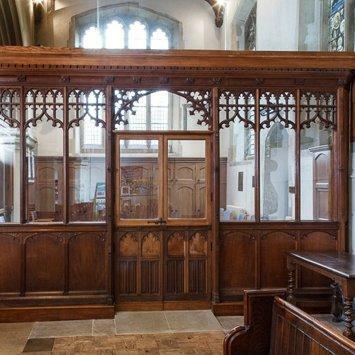 We, DAC and English Heritage agreed that the east end of the south aisle presented the best space for this new room. 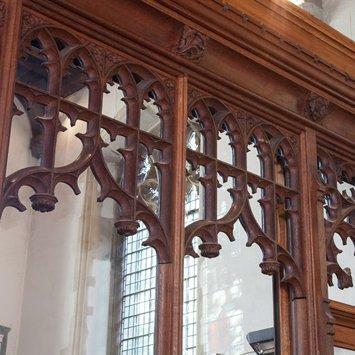 The north aisle already had a lovely Victorian tracery screen into the chancel. 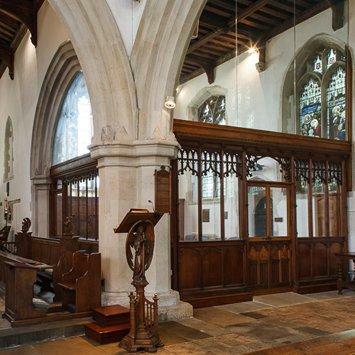 We were keen to maintain this view and visual interplay between the spaces, so designed a structurally glazed, frameless glass screen which was constructed behind and above this existing oak screen into the chancel, creating a transparent separation. 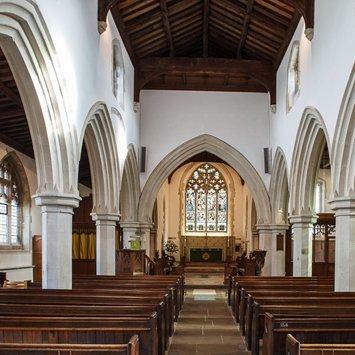 To separate the space into the south aisle, a Victorian oak tracery screen was relocated, and frameless, structural glazing inserted above, with the added benefit of opening up the Chancel to the Nave; as the congregation wanted to establish a more visual connection to the Chancel and altar. The glasswork was carried out by Jamie Paxton, a glazier and member of the congregation. 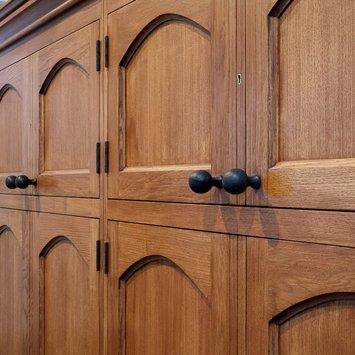 We complemented the oak screens with oak built in robing cupboards on the east wall, and a kitchen was hidden behind the rear of the oak screen to the west. 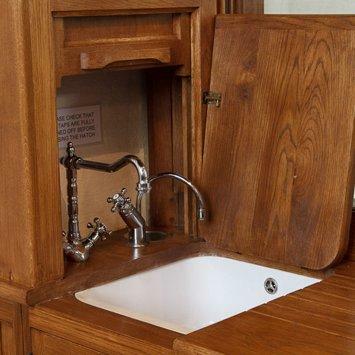 We incorporated a lift flap to hide the basin, and sprung sash cupboard door to hide the tap. To create level access for crèche push buggies and wheelchairs into the new room, two stone slopes were added at the external north aisle door and relocated screen door. 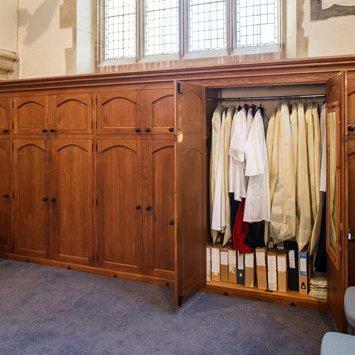 This room has transformed how the church is used, creating a separate, warm, informal space, used ardently by the community throughout the day. Inside the church, there is now a lovely view of the east window and alter. 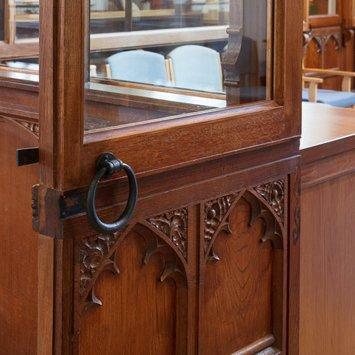 Furthermore, the arrangement of the two existing historic Victorian screens, with modern, transparent, frameless glass maintained the visual interplay of the spaces and silhouette of the tracery, combining elegantly the history of the church with a modern new use.